Thinking about creating online courses for your audience? Greg Smith, Co-Founder and CEO at Thinkific, delves into important steps to achieving this goal. A lawyer, instructor, and lifelong student, Greg has taught thousands of students online and helped others create their own online courses. Learn more about creating online courses and resources to help you get started. 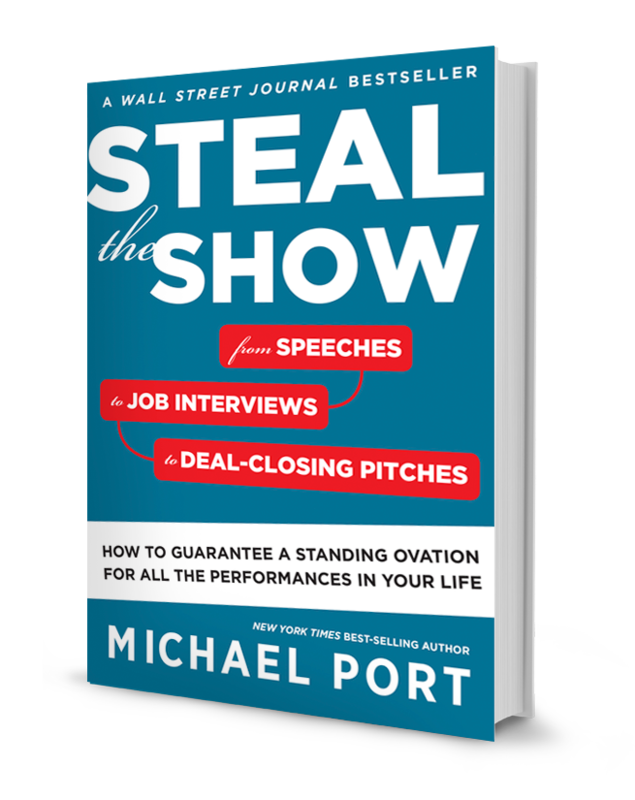 00:00 Michael Port: Welcome to Steal the Show with Michael Port, this is Michael. Today’s guest is Greg Smith, and he’s the founder of Thinkific.com. 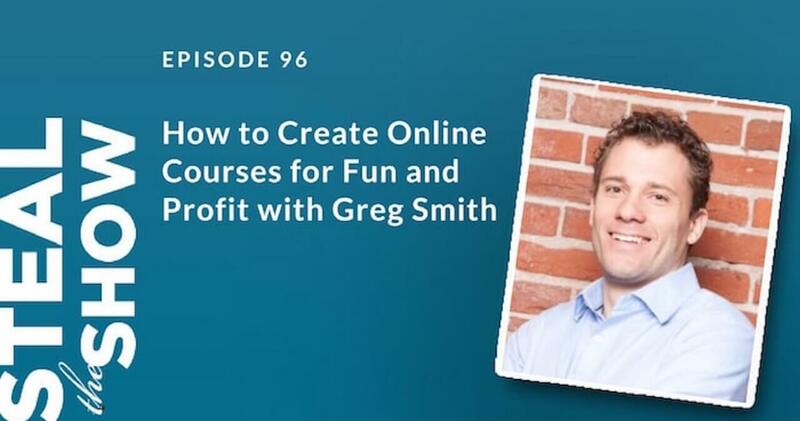 Thinkific allows anyone to sell their own online courses, under their own brand, on their own website; and Greg is passionate about education, as you’ll hear in today’s episode. He is a lawyer, instructor, and life-long student. And he has taught thousands of students online and helped others create their own online courses. As a founder of Thinkific, Greg’s goal is to help you create and deliver amazing e-learning experiences. He likes kite boarding, and I mention that because I have never actually met anybody who kite boards, camp fires and board games. Hey, buddy! 00:52 Greg Smith: Hey, how are you? 00:53 Michael Port: I’m good, how are you? 00:56 Michael Port: So in the introduction, I disclosed to them that you were a sponsor, or Thinkific is a sponsor for Heroic Public Speaking Live recently, and… I always like to disclose any potential conflict of interest, but that you are not here because that’s part of your sponsorship. You’re here because I think what you’re doing in the arena of content creation and online learning platforms is the best, so I wanted to interview you so that you could help the folks that I teach take their intellectual property, the material that they usually present themselves, and turn it into courses so that they can be a little bit more leveraged and can reach more people. 01:47 Greg Smith: Well, thank you, I appreciate that. And sponsorship aside on the Heroic Public Speaking, I have to say we don’t always go to all the events that we get involved in, but I was so glad that we had the opportunity to come ’cause it was… I feel like we got a really good deal as a sponsor because I learned so much there and it was such an amazing event. I met so many awesome people and definitely had a lot of takeaways that I can put to work in my career for sure. 02:13 Michael Port: That’s fantastic. It was wonderful seeing you. You’re obviously a real learner because you’re always in one of the front rows. That’s not just because you, of course, had VIP seats, but even in the rooms where that wasn’t relevant, you were in the front rows and you were just always there with your notepad and fully focused. And I wanna know, before we start talking about the content piece and learning platforms, you have… You’re over 30 employees now at Thinkific. 02:44 Michael Port: You’re the founder and you’ve been creating this company, which is growing quite quickly for some time. A lot of the people who listen to this show are trying to do things that are similar or are doing things that are similar. What have you found to be the most challenging or what have you found to be the most exciting? 03:08 Greg Smith: When generally… In building a company, especially at Thinkific, I think the most… Both the most challenging and most exciting for us has been building the team and the dynamics of creating a team and how that changes from a couple of people with no payroll to where we’re at now, over 30. And I found sort of at the seven person mark, there was a real change, and then again at around 15. At seven people, every conversation that goes on in the office, you’re part of or you can overhear, you know what’s going on; at 15, suddenly you start to lose touch with that and so you have to start to think about systems and processes and working together as a team in a different way and really fight to keep your core company culture. So that whole team building, finding amazing people to work with and then making sure that we serve them really well, that’s been the most exciting and at the same time challenging part for me. 04:04 Michael Port: I feel the same way. That is one of the challenges that I did not expect to the degree that I found. There’s a lot of things that I assumed going into a business. I assumed the really difficult part was the sales and the marketing and booking business, but frankly what I’ve found is that stuff, once you get a handle on it, that can come pretty quickly. But growing something that has legs, that has a substance, that’s all about people and processes. 04:43 Greg Smith: Yeah, and so much of the other stuff takes care of itself if you have amazing people to work with, and we’ve been really lucky to find some amazing people, which means that certain areas like marketing, sales, creating content, building software just… Well from my perspective, it feels like they handle themselves and they just work wonderfully well, but it’s just being lucky to work with such awesome people. 05:04 Michael Port: Yeah. Look, I started in 2003, so there was no live streaming, there were no social media platforms, and very few people in the public speaking industry and even the coaching and training industry were using online learning platforms. They were still kinda new. Universities were using them more and more, but they weren’t as prevalent as they are today. But when I started, I never wanted to be a professional speaker; I didn’t really even know that existed. I wanted to build a business based on what I taught, and so the public speaking, that was something I did at the beginning to get the word out; the professional side, the big money side, that came later almost by accident. But in the beginning, I was really trying to focus on, “Well, how do I build something that could scale? That’s a real business, not just a practice where I have to show up all the time?” And I looked at what the universities were doing, and I said, “Well maybe I can do something similar.” And of course the question was what software were they using, and most of them were using a software called Moodle, which of course you’re familiar with, I’m sure. And so I said, “Okay, I’ll use Moodle.” Oh my God! So it was just me at that… I was just… I was the… What is it? The cook, the bottle washer, and the server? I did everything. 06:27 Greg Smith: And the janitor, yeah. 06:28 Michael Port: And the janitor. I figured out how to use Moodle, I figured out even how to skin it. And I’m not a techy, I have no background in computer science programming, but oh my God, the amount of work that went into building courses for the students that I was serving was massive compared to the present. So I’d love you to take folks through the history, a brief history, of where online learning started and then where it is today, and what is possible for people who are not necessarily super techy but wanna take their ideas and organize it in a way that they can deliver it to more people? 07:13 Greg Smith: Okay, sure. Yeah, and that… But the history part’s an interesting… I don’t know that I’m the expert on the full history, but I did… Some of the books I’ve read on it recently around where it got started was I think a lot of the mistakes that were made in the early days was using technology in education for the sake of technology. So saying, “Hey, we can do these things with technology, so let’s do them in education.” As opposed to, “Is this actually a good idea and will it help people learn?” And so I think in the 80s and 90s, really early days in any kind of online learning, you saw a lot of stuff like that where it was just tech for the sake of tech because it was exciting and interesting. And I still see some people make that mistake today, but I think we’ve come a long way now where technology is almost… Ideally, it’s almost invisible and it just helps serve you delivering your message and doing that training. So that’s really where we’ve tried to get to with Thinkific, is making it in a place where it just facilitates making it super easy for you to share knowledge, for you to teach, and then for people to actually absorb it and put it to use and learn from it. 08:23 Greg Smith: And so in terms of what people can do today, it’s taking the problems that you can solve and how you can help people, and I really like to focus on that how you can make their life different or how you can solve that problem as opposed to, say, Biology 101 or, “Let’s just get better at this subject matter.” It’s really great to be able to show a result. It’s actually one of the things that you say that really resonates with me is that you can have a standing ovation for all of the performances in your life. And that really, to me, sums so well what it is that you’re helping people with because I can visualize how my life’s gonna be different if I learn from you. And so having a message like that I think is really important as opposed to you could go out and say, “I’ll just teach you more about speaking.” But that doesn’t… Then I have to think about, “Well, what does that mean to me? I’m not an actor, or I’m not a professional speaker, or why would that matter to me?” But you really share with people why it’s gonna matter and make a difference. So I think starting with a message like that helps with everything that you do as you go through and start to share knowledge with people and do things like create online courses. 09:30 Michael Port: Do you find that the people who are most successful with their online courses on Thinkific are the folks that have an incredibly clear brand identity? They know what they stand for and it’s front and center in all of their work. Do you think that’s a big part of what makes them different? Because there are certainly lots of people who have similar expertise. So why does one person become so successful whereas the other one doesn’t, even if they might have similar experience or levels of expertise? 10:08 Greg Smith: Yeah, and you’re right. There’s… Well, a few things. There’s a lot of competition in different areas of… Well, in all areas of business and in online learning in particular. So the space that I chose to go in when I first started teaching online about 10 years ago was in the online LSAT course, the law school admissions test, and the amount of competition in that space was quite large already then and is huge today. But my course does quite well, and I think there’s a couple of things that come down to that that I see similar in a lot of other successful courses out there. One, as you said, is brand identity and having a really clear idea of who you are, and how you’re different, and what you’re gonna offer to people. Another one can just be marketing. It is possible and I’ve seen people with not the greatest brand identity or clarity of message that just do a great job of digital marketing, but they’re always limited by that factor of not having that clear message of what you’re offering, how you’re gonna change someone’s life, what they’re getting out of working with you, and what your brand and differentiating factors are. So if you can bring those two things together, that’s where the amazing opportunities for success and growth lie, I think. 11:14 Michael Port: Is that… Was that… So you were teaching online courses. Were you dissatisfied with the platforms out there? Is that why you created Thinkific? 11:46 Michael Port: Well, aren’t you lucky? I want a brother like that. 11:51 Michael Port: Do you loan him out to your friends? Can he be like an honorary brother? 11:56 Michael Port: Yeah, exactly. 12:00 Greg Smith: Yeah, he’s built a bunch of other fun stuff in social media lately now, but yeah, that was definitely helpful. So we built our own platform and then people started calling and saying, “I’m struggling with building everything in WordPress or Moodle or Drupal or some other system. How can I… Can we take the software that you guys have built and use it?” And initially they couldn’t, so we started over and rebuilt everything in a way that we could share it with everyone really just with the goal of making it super easy for other people to go and launch and share their own information. 12:32 Michael Port: Yeah. There are some people I think who see themselves as natural content creators, and there are others that have expertise but they don’t see themselves as natural content creators and so they get a little hung up around the idea of creating content that they can teach online or people can consume in a way that’s self-directed online. So what do you suggest those folks do? Do they need to become extraordinary writers or video performers or can they outsource some of this work? For the folks who get a little bit hung up, where should they start? 15:54 Greg Smith: Yeah, and I think that’s an important piece. But it doesn’t mean you can’t brush up first and work on your actual personal delivery skills. So I know… Actually, one of the people who uses our platform was at your Heroic Public Speaking event, and you shared his transformation video, which I thought was mind-blowing of the before and after. I think he’d gone to grad school and so he… You shared his video at the start of grad school and then his video at the end, and it was just night and day. So I think there’s a difference between your personal delivery style, which you definitely can work on and make a big difference on early days, and then things like worrying about technology and actually creating content. So if you can up your game on the speaking side a bit, that works well. I was lucky I came in, I’d already been teaching in a classroom and coaching people so I had a pretty good idea. But even that, I’ve improved dramatically from where I was at teaching style-wise from 10 years ago to today. 18:23 Michael Port: So for example, here’s a really easy example. Say, take Brian Scudamore, who’s the founder of 1-800-Got-Junk. When he was in high school… I mean in college rather, he just got a truck and him and a friend put on clean clothes and they went and picked up people’s trash and they did it to make money in college. Well, they did pretty well, so they got another truck and he hired some friends of his. And they did pretty well too, so he said, “You know what? Maybe there’s something here.” And he thought long and hard about what strategy would he use to grow this, and he decided to franchise the idea. And as soon as he did that, he was no longer in the junk business, he’s now in the franchise business and that’s an entirely different business than actually picking up the junk. So when you go into an online education business, it’s probably a good idea to ask yourself, “Well, what are the skills that you need to develop based on that particular business? What business are you in at that point?” So what do you think the skills are that somebody should be focusing on? So you mentioned the performance side, of course; obviously I agree with that. What else? Are there technical things that they need to learn? Do they need to learn a little bit more about how to shoot videos? How to edit them? What about their writing or creating… They gotta… Maybe they’re creating exercises for people to do and homework assignments, and what else do they need to work on? 19:54 Greg Smith: Definitely. So there’s some quick things that are relatively easy to pick up that make your online learning experience a lot better, and I really go for two goals in this vein of creating your content. One is retention of information, so that’s actually learning. So if someone walks away, what are they taking away with them? Is that something they can put to use? Are they gonna remember what you taught? And then the other is the motivation side because one of the big challenges in online learning is keeping them motivated. When you do that public speaking, you do have a captive audience, you do you have to sort of fight against their maybe desire to check their phone or nod off if you’re not putting on a great performance. So you still fight motivation there, but especially in online learning, you have to keep people motivated to follow along and even just finish the course so that they can retain the knowledge. So a couple of things that I really like to do that are all based on empirical data and studies: One is to keep your content, each individual piece of it, short. So two to seven minutes, ideally if you’re doing a video, even if you need to talk about a subject that’s gonna take 30 minutes or an hour, cut it up into little pieces of two to seven minutes. That will dramatically increase the completion rate in your courses because people can consume that and then just click a “next” button to go on to the next piece of context. 21:18 Michael Port: Well, before you do that one, let me ask you a question. So when somebody is creating that content, should they first design it in these two- to seven-minute chunks or do you think they can, say, shoot a course and then break it up based on looking at all the material and say, “Okay, that’s probably five minutes there, that’s three minutes there.” Do you think it’s important to storyboard it out, so to speak, so that you know, “Okay, this is a three-minute segment here, this is a five-minute segment.” And title them in advance, get really clear on what the learning is, the takeaways, the deliverable in each one of those sections, or do you do it all together and then break it up? 22:00 Greg Smith: I’ve done it both ways. So I’ve gone and just… Even when I was filming people, I’d film them for hours in a studio and then we’d just make the decisions and cut it up afterwards. And that was only because I knew that they already had a talk, or a speech, or a course that they were delivering live, and to ask them to make that transition, to cut it up into bite-size pieces on their own, they probably never would have gotten around to it and it would have really stalled them. And so we just cut it up for them on the video side afterwards and just made a decision of, “Oh, here’s a good break between a couple of topics or sentences, we’ll make a cut there.” So you definitely can do that way. Personally, when I do it, I do… If I’m writing something brand new, I will keep this in mind right at the beginning and I actually… I start with a clean piece of paper, I put at the very top the question, “How will my life be different after I take this course?” or, “How will your life be different after you take this course?” I answer that, and then based on that, I do some high level milestones. And then under each milestone, I’ll do some steps to get to that milestone, which will get you to that big end result. And I keep breaking it down in this sort of tree-like structure until I get to something that I can teach in two to seven minutes. 23:04 Greg Smith: And now I know I’ve got a lesson and I’ll go and create that lesson. So I end up with a bit of a tree on this one page that’s gonna be my overall summary, and then I go and create those individual lessons to meet those things. 23:16 Michael Port: Are there courses at Thinkific that people can take in how to create courses? 23:22 Greg Smith: Yeah, we’ve got a ton of… We’re an education company and one of our core values is learning and growing, so we love to share all of this kind of stuff with people in terms of how they can get started in creating courses. 24:05 Michael Port: Anytime I hear, “So much easier, so much easier,” I know we’re on the right track. So your second, you said. So first, it was this organization, you can do it both ways. If it’s… From the start, you like to set it up and sort of tree it out, so to speak, and then identify those shorter chunks. And then produce the content after that. What was the next point that you were making? 24:30 Greg Smith: The next point was about having formative assessments, which is really just a fancy word for a quick quiz question that helps you learn. So it’s really… I like to put it after every video or every few videos, often something like a multiple choice question or two. Not a huge quiz, and it’s not… You’re not getting in there and trying to prove if the person is really smart or they’ve learned a ton. You’re just asking one or two quick questions to confirm that they watched your lesson, that they were paying attention at all. So if you were asking a question here, I might ask, “How long should your online lessons be?” Two to seven minutes, answer choice A; 30 minutes, answer choice B; or answer choice C, an hour or more. And hopefully if anyone is paying attention, they would quite easily get two to seven minutes. So it’s not a really tricky question, it’s just checking to see if you’re paying attention, and that dramatically increases how much people pay attention going forward. But they’re also much more likely to recall things afterwards because it’s forcing them to go through this mental exercise of processing and kind of assimilating all of that information that you’ve just shared with them in between each of these short lessons. 27:11 Michael Port: So the first one was right, by the guess; second… And then I just started guessing until I got them, just to try to get through quickly. And then alright, move on and learn the next one because it just slowed me down. And I’m a fast learner, and although it doesn’t seem like that based on the way that I’m describing the fact that I couldn’t answer the questions, but they really were… Some of them really out of left field. And until you actually sat down and started studying for the test itself, they were premature. So I really like your suggestion that you’re not trying to dumb it down so that anybody, even if they’ve never watched the course, could get the questions right. But you’re not pushing people to such a degree that they feel that they’re not being successful because one of the most important aspects of education is the student feeling successful. 28:03 Greg Smith: Yes, definitely. And I think that point you hit where you were demoralized is really the key there, because you were demoralized in taking those, but you actually wanted, and really wanted, to complete those courses so that you could have that certification and participate in that. 28:19 Michael Port: Yeah. I also wanted to know what to do, given the situation, ’cause some of them are life and death situations. So I think they could use a little bit of help from you. 29:18 Michael Port: Yeah. Engagement is… You mentioned this before, it’s worth repeating. Engagement online is much more difficult than engagement in the room. There’s just no two ways about it. If you can engage a room, it doesn’t necessarily mean that you’re gonna be able to engage people who are sitting behind their screen half a world away and not actually interacting with you. So the design of the course and the interactive elements are critical. So in addition to those kinds of questions at the end of each section, what other interactive devices or exercises do you recommend? 30:03 Greg Smith: One thing, and again, I think you did this at the end of Heroic Public Speaking, was having an accountability partner and you’d encouraged us all to pick someone in the audience or someone who was there, someone we’d met to have our own accountability partner. And I’ve found that that, in online courses, can be huge for encouraging people to complete and get value out of their course. So even just building some kind of community, whether that’s a Facebook group or we have built-in discussions or something where people can interact with each other and share their progress and share what they’re doing. The accountability partner specifically, though, is… Statistically is really high on the list for helping people complete and get value out of any kind of program, especially online learning. So that’s another one that I’d definitely work in there. I don’t know that it’s super… It’s not interactive in a very techy kind of way, but it certainly makes the course more interactive for you because you get to actually talk to someone and talk about what you’re learning and share what you’re learning. 30:55 Michael Port: And the less techy, the better because so much of the experience is technical. So if you can create high-touch interactions, then you’re gonna create more emotional connection as well. 31:13 Greg Smith: Yes, definitely. 31:14 Michael Port: So let’s talk about these discussion groups because one of the things that worked very well for us a decade ago were discussion groups inside of the learning platforms that we’d use. But as Facebook took over the world, we found that we were having more trouble getting people to engage inside our learning environments because they just weren’t there all day long the way they were on Facebook. So when we would use Facebook groups, people would engage regularly, all day long. So much so that I would tell people, “Get off of Facebook please and go do something out in the world.” But it made it easier. So we stopped using… This is before we were using Thinkific, but we stopped using the discussion groups inside the learning platforms and we really moved the discussion to Facebook. And for us, the platform we were using it didn’t integrate Facebook into the platform. People had to be part of that Facebook group also, so that wasn’t ideal. But how have you seen this present it self and how do you suggest people choose where they should be doing their discussions or trying to get their people in their courses to talk to one another? 32:34 Greg Smith: Well, I’ve seen exactly the same thing you’ve just described there in the move to Facebook for discussions. I still run some discussions in some of my courses and I use it just in the built-in discussion in our platform. And that can work well, it can create a different level of privacy and tie it to the content within the course. But you’re exactly right, that no matter how well you do that, there is an element of more continuity and usage and engagement in Facebook, especially after completion of the course. So what happens with the discussions that I have in my course is people are actually reasonably active while they’re taking the course, but when they finish, then, as a graduate of the course, they don’t necessarily or rarely ever come back in and help other students whereas with the Facebook groups, you have people who finished your content years ago and they’re still big fans and they’re still putting it to use. And they pop back into the Facebook group regularly and act as ambassadors and coaches and help other people, which takes some of the work off our plates, but also helps these people learn more as coaches because one of the greatest ways to learn is to go and teach others. 33:38 Greg Smith: And so you’ve gone through and sort of graduated from your level one and then you go and start teaching and sharing and helping other people in a Facebook group or even in real life, and suddenly you’re taking your skills up to level two or much higher. I still think… The Facebook group, we’re working on some ways to kinda integrate with Facebook and get more of that into our platform, and we do have some integrations. But the group specifically, it’s really hard to… Facebook doesn’t fully allow you to just extract that and drop it inside of your application. So the Facebook group is still a great way to do that interaction. 34:09 Michael Port: One of the things that we use to do each time we did a course, even if we taught… So historically, we would teach… Some courses were you just took on your own, just self direct, and we still have courses like that. And we’d have other courses where there was some live component online, webinar, teleseminar, and then there was another component of the course that was via the learning platform. And when we would do the courses where there was a start and end date, and we were teaching some live content also as part of the course, we would set up a Facebook group for that particular course, and we’d have a lot of people in the programs so, it was a little easier to start the discussion amongst people because of that. And then the course would end, and that would be it, and people would still talk to each other in Facebook but it would start to die out after a while, just like you were talking about with the discussion groups inside the learning platform. And then we do another course three months later, same course, we do it again for different people. And we’d start another Facebook group that was specific to that course, and then after that course, that would start to peter out. Some people would still talk, but… So you see the pattern that’s occurring. 35:21 Michael Port: So what we discovered was that if we have one central Facebook group that anybody who has been in any of our training programs, even if it’s a really quick online training program… They have to be actual clients. They’d not download a freebie, but they have to have paid for and participated in some sort of training that we provide. So it could be self directed, but it may be our highest level, most comprehensive trainings. They would get lifetime access into the Facebook group. There’d be no fees for being part of the Facebook group, but that Facebook group just gets bigger and bigger and bigger because everybody who has participated in any of our courses is now in there, and just like you’re saying, people will come in and out. People who took a course two years ago will show back up and go, “Oh my God, I just wanna tell you about this win I had. Two years ago when I took this course at HBS, blah, blah, blah, “this just happened.” And we find it remarkable. Now we still do some smaller Facebook groups for some of the smaller; very, very high-touch training programs because we want what’s in there to be confidential just for that group, but they still are involved in the primary group. 36:42 Michael Port: So it’s not just a group anybody can join that has no connection to us, but we find that works so much better than starting a new Facebook group each time we do a new course. We just dispersed our people all over the place and we didn’t get the value of the aggregate of all of those people over a long period of time. 37:03 Greg Smith: Yes. And I love that story of sharing the wins, that’s one of the favorite things of mine that I see go on in Facebook groups is when you have graduates and other people of programs come back and share some of their wins and it’s just… It’s so inspiring for us to have helped them get there, or helped provide some of the knowledge, hopefully, that helped them get there, or the tools. But also for the new people who are joining and seeing what is possible, especially when you see some of the stories of, “Here’s where I was and here’s where I am now,” it makes it seem possible for anyone who is seeing that and inspiring to help them go on. So I think by doing that, you’re definitely adding a lot more value for your audience. Plus there’s a whole element of social proof and marketing that goes on there by having a bigger Facebook group. 37:43 Michael Port: So John Jantsch was one of the presenters at HBS live this past year. You might have spent some time with him when he was there, and for those who are not familiar with his name, he wrote Duct Tape Marketing and many other books, good friend of mine. He wrote an article after the event about culture, and it was one of the best description… Sort of the best description that I’ve ever seen on how culture is created because these courses that we teach, they produce a really remarkable culture inside our organization, and I don’t mean the people who work for the organization, I mean the people we serve. And he said that… And we often get a lot of credit for it, and I say, “I appreciate it, but it’s the people. The people inside here are just so remarkable.” And what he said is the reason that culture is created in these kinds of communities, and he was using HBS as an example, is because people transform as a result of being part of the experience. There’s a transformational element, and when people go through something transformational together, they’re bonded. And that’s what creates the culture, and you can do that with your online learning courses. Maybe not as easy as putting everybody in the same room together, but you can… If your courses are working well, people will transform. 39:21 Michael Port: And if you are getting those people connected with other people who have had transformations as a result of those online courses, you’re gonna create a really remarkable community. 39:32 Greg Smith: That is such a great way to look at it with the transformation. It’s funny; as you were saying that, I was having visions of how this applies in cults and the most strong culture organizations out there, but even things like fraternities or they’ve shown even in study groups, if there’s some kind of initiation process or screening to get in or transformation that occurs as part of it, then people value the group itself and the members of it so much more than if there isn’t anything like that going on. So that’s… It’s a really interesting way. I hadn’t thought of it that way before, but it’s something that I think we could definitely share with our audience as well as course creators to make sure that they offer to the people who are listening now to make sure that you work into any of the training that you’re offering that opportunity to share transformation with other people in the group because it sounds like that would really increase the overall value to everyone. And as you said, that culture that you get to build. 40:31 Michael Port: Yeah. ‘Cause one of the things I’ve found over time is that people initially… They initially come because they want to know what you know or they wanna do what you’ve done. But what they discover throughout the process, if the courses are good, is that they’ve changed in ways they didn’t expect, and that’s where the big value is. So that’s what we try to focus on is that transformational aspect of it because that’s where you get the fans for life. So it’s not just about delivering the information, and I think that’s where a lot of folks put their attention when they’re creating courses online is just in the information aspect of it, but how do you create transformation based on the information you’re teaching them and the experience you’re giving them? 41:27 Greg Smith: See now you’re teaching me, this is great. 41:34 Greg Smith: No, I’m almost looking for a pen here to take some notes, but I’m just gonna come back and listen to this again later. 41:41 Michael Port: That’s great. So from a technical perspective, when somebody is looking at choosing an online software, what should they be looking for? Obviously you’re biased, which is fine. I have no problem with that. 41:56 Greg Smith: Only slightly. 41:57 Michael Port: Only slightly. But I’d love your perspective on what you think is most important, from a technical perspective, for these learning platforms. 42:08 Greg Smith: Yes. And speaking to the bias, I… One of the first courses that I… When we first started this, we would create courses hands-on with people. I would actually go to… We built a little studio, and I would go there and I would film people and even edit their videos. One of the first ones we did was this great sales course and… With a high-profile sales speaker, and one of the things I learned there from that, just watching him film that course, was around selling the right solution to people, and even if it’s not yours. So when I’m talking to someone about picking a technological solution and what they should be looking for, the most important thing to me is that they get the right solution. Because if ours is not the right solution and I’m just a good salesperson and I can sell them on that, that doesn’t work out well for them or for me in the future. 42:54 Greg Smith: And so what I suggest they look at… One of the biggest things is ease of use. That’s huge. It has to be easy for you. You’ve gotta go in and play around with it and make sure that you’re happy, that you can use it. And poke around and play with things. And try and do the things that you want to do, and make sure that it’s easy for you to use, because otherwise, as you’ve found with some of the other tools out there that were a little more archaic, is over time that the amount of time you spend trying to figure out software can hamper your motivation to actually produce knowledge and share it with people, and that’s really what you should be focused on. 44:19 Greg Smith: Yeah, that’s ridiculous. But you get these huge lists of features, and I would say focus on the simple stuff of being able to create and share your knowledge, and then get out there and market it with people so you can find people to actually take it and get value out of it. Those are really the highest level things is making sure it’s easy for you to use; it’s gonna look good when you go out and deliver because when you’re putting your brand on this and your name on this and you share it with people, you wanna make sure that you can make that look good. And it’s gonna appear good both from a marketing perspective, and then as people go through and take it. And then ideally, looking at some of the things that I talked about in terms of making sure that you can break up your content and do things like those formative assessments because that will make a really big difference in terms of completion rates, and completion of your course, as I said, translates to repeat customers, referrals, testimonials, all of those great things, and building that community and that transformation. 45:35 Greg Smith: You got it. 45:35 Michael Port: Yeah. That’s where you can find the software that Greg’s been referring to, and I’m just a big fan of what you’re doing and who you are. I just think you’re very cool, and you’re doing really cool things in the world. 45:50 Greg Smith: Thank you, Michael. I appreciate it. Now, that feeling is definitely mutual. And you know what? We could put something together, just thinking of a bunch of the resources and ideas. I know some of them go a lot deeper than what we were able to share here today, so if you want, we could put something together at get.thinkific.com/michaelport, and then I’ll share with people there or we could do Steal The Show. What do you prefer? 46:12 Michael Port: Steal The Show is good. Yes, Steal The Show. 46:14 Greg Smith: Okay. So we’ll do get.thinkific.com/stealtheshow. We’ll share some resources to go a little deeper into some of the things we talked about here today to help people if they’re looking to get started or improve their online offerings, then we can give them some resources to make that really easy. 46:29 Michael Port: That’s fantastic. And we’ll put that link in the show notes, of course; and then when we share this in the email, newsletter… Each week we share, “Here’s the podcast episode for the week,” we’ll put that in there too. So it will be get.thinkific.com/stealtheshow. Is that right? 46:45 Greg Smith: That’s it. 46:46 Michael Port: Fantastic. Thank you so much, Greg, and thank you everybody else for tuning in. I never take it for granted. I think it is an opportunity to be in service, and I hope you keep thinking big about who you are and about what you offer the world. Until next time, bye for now.